My feet get sore, often. I have a 4 year old who I'm constantly chasing and I spend a lot of time on my feet. I spend about 3 hours at the gym twice a week in a weight lifting class, body combat class, core work class, and zumba, so yes, like I said before--My feet get sore, often. 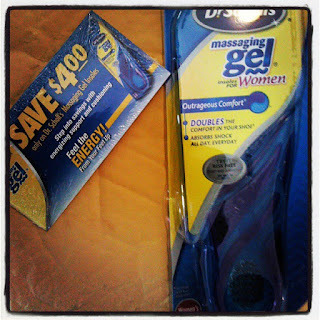 As a member of BzzAgent, my most recent campaign was for Dr. Scholl's Massaging Gel Insoles for Women. I was eager as ever to try these. I pulled out of the box and grabbed some shoes.I removed the insoles from my sneakers that I wear most of the time to both the gym and to run around throughout the day. After cutting the Dr Scholl's insoles down to my size I put them into my shoes-- Yes, you can cut the gel insoles very easily to your own shoe size. Very cool. I wore them to the gym and couldn't believe that my feet were not aching this time. And believe me, I did not take it easy on my feet at all that day. I moved around a lot, jumping and kicking, and squatting and running, and my feet felt pretty good afterwards. Then I headed to the store and walked around comfortably. I'm not joking, guys...My feet felt good! So, of course, I use them every time I go to the gym! I am really happy with these. This campaign is now actually one of my favorite campaigns that Bzzagent has allowed me to participate in. I received coupons and have been handing them out like crazy. I know so many people who could definitely benefit from using a pair of these, especially my husband who is constantly on his feet, as well as my mother. Maybe I'll slip some in their stockings this Christmas??? I know they'd be happy to get them. If you suffer from sore feet too, why not give them a try? I totally recommend them.